The risk of getting one’s hands dry and chapped is on the higher side during winter season however there are many who may be suffering from the problem all throughout the year. The dryness further gives way to chapping of the hands when the skin loses its natural moisture or oils. In order to avoid any further damage to your hands make use of certain home remedies that are available right around your house. 1. A bedtime remedy – Each night before indulging in your peaceful sleep, follow the practise of soaking your hands in lukewarm water. After the session of about fifteen minutes, simply dab your hands. The dabbing should be intended for eliminating any excess of water on your hands and not for completely drying them. This is a very simple and effective method of rehydrating the dry skin on your hands. 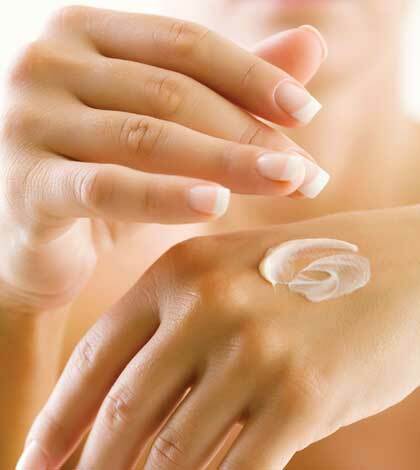 Further make use of any petroleum jelly or deep moisturiser of your choice on your hands. Apply such lotion generously all over the hands making sure no parts or patches are been left. Next cover your hands in a pair of gloves etc and complete your beauty sleep. The application will work on your hands overnight by healing the damages without interruption. In the morning your hands may still be retaining that greasy or oily feeling, to avoid it gently rub it with soft tissue or cotton. One may observe a noticeable change in the texture of their hand skin which will be much soft and delicate to the eye. 2. Applying a direct dose of vitamin E on your hands – Rehydrate the skin on your hands by moisturising them over night, next morning let them soak in the lukewarm water for about 15 min. While your hands are still damp from soaking, apply the vitamin E dosage in a capsule directly on to your hands and rub it in. This is a special treatment for your dry hands, wherein they are offered with direct application of vitamin E for faster healing. 3. Wonderful and juicy aloe Vera – Treat your hands with a natural resource of Aloe Vera. Cut a leaf and apply the sticky juices stored on your damaged hands. Retain such application for certain time period and then rinse it off. A daily application will reap wonderful and lasting effects for your hands and its texture. However one is advised to limit their exposure to chemicals while doing household chores. 4. Lemon juice –Soaking hands in lemon juice for about 5 minutes twice a week, can reap excellent results by reducing the dryness on your hands miraculously. 5. Protecting your hands from chemicals hidden in hand wash or soaps – Unless absolutely necessary don’t wash the back of your hand with hand wash or soap. The reason been the skin behind your hand is much thin and delicate and is at a high risk of dryness. Instead keep it moisturised at all the times. 6. A great Diet for dry hands – One should ensure that their diet is incorporated of foods that are high in omega 3 element. Facts state that such practice has a lovely effect on one’s skin making it soft and glow. 7. Washing the dryness away – When one is exposed to the harsh dish washing work, they are expected to add baking soda to the water they may use for cleaning. The baking soda will ensure that your hands are not washed away along with the essential oil levels needed for keeping them soft. 8. Exfoliating – Massaging and exfoliating your hands will ensure of eliminating of any dead skin. Reduction of dead skin will give way to a lovely pair of soft and supple hands. 9. Oils pampering your hands – When no moisturiser will break the layer of stubborn dryness, one should make use of olive oils. The antioxidants present in olive oils essentially moisturises your hands. The healing and repairing of one’s dry and chapped hands can be expedited and further beautiful and youthful hands can be regained. 10. Kitchen remedy – Powdered coconut and powdered sugar mixed together are great healers of the dryness problem in ones hands. Make use of such combination as a scrubber for your hands which will efficiently remove the dead cells and leave your hands with the healthy oil dose from the coconut powder.